Hello! Hope you had a lovely Valentine’s weekend. My weekend started with a long run on Friday afternoon. I wasn’t sure if I was going to run or not because my nose was a stuffy mess all morning, but I felt okay later and followed the “neck rule” of running: Green light if your symptoms are above the neck (i.e. head cold); Red light if your symptoms are below the neck (i.e. chest cold). And good thing, too. I had a fantastic pain-free & sinus-clearing 10 mile run, which is the longest I’ve gone post-injury. I ran a 3-mile loop three times and then circled the parking lot until I hit 10 miles. Sometimes I have days where I’m in the mood for a monotonous route that requires no thinking. Anyone else? I’m not sure if running long makes me crave sugar or what, but I went grocery shopping before Ryan arrived later that evening, and I somehow found myself at the checkout line with cake mix, ice cream, cool whip, and a bunch of toppings for breakfast crepes. 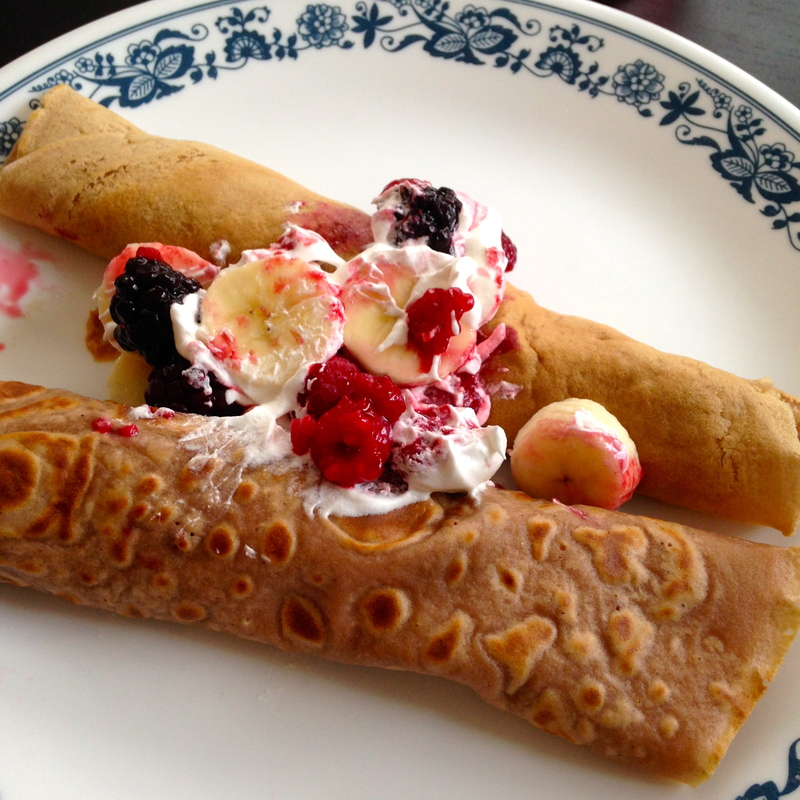 We started Valentine’s Day with two batches of crepes (Ryan’s mom’s mom’s delicious recipe!) and an assortment of fun fillings. The line-up: frozen berries, sprinkles, chocolate chips, peanut butter, jelly, Nutella, bananas, and cool-whip (unpictured). I went for the classic peanut butter + fruit + banana combo for all of my crepes, but Ryan thought outside the box and brought in a few new players, including chocolate ice cream and dark chocolate Easter eggs (um, that he found in my pantry from last Easter). Later [waaay later because it took a long time for either of us to be hungry again], we went to Qdoba for the “kiss for a BOGO smothered burrito deal.” Ryan actually ate both smothered burritos (he continues to awe me), and I ordered tacos. 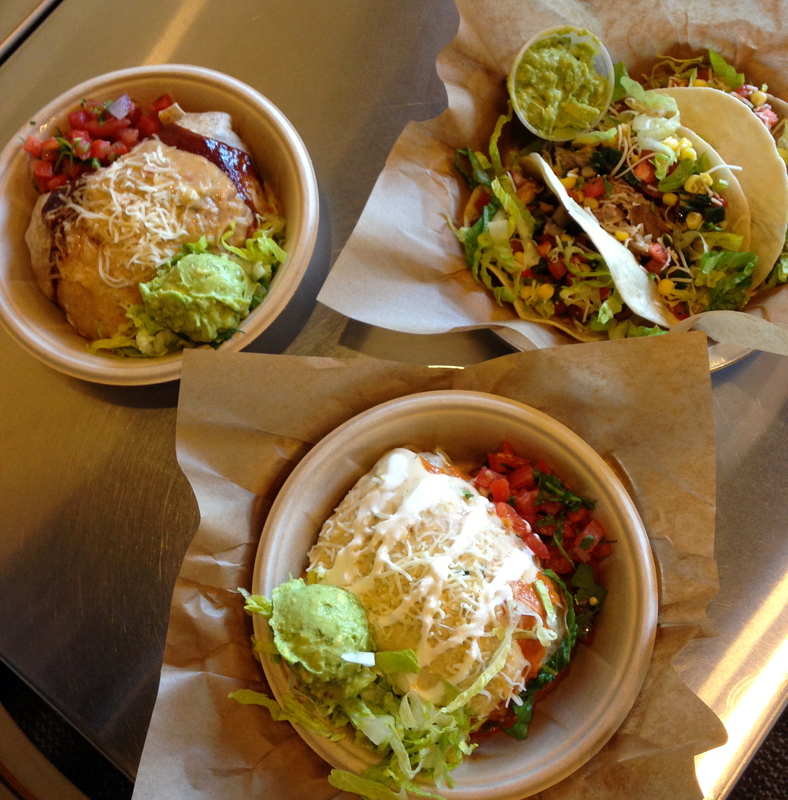 It might sound like all we did all weekend was eat, and that’s pretty accurate. We made a jello cake on Friday night that I’m not even sure what to do with because my stomach is boycotting sugar. We also fit in two killer workouts. Sat: 80 min strength circuit. We created six different groups of 3-4 exercises and completed each group in a 6-minute AMRAP style, and then repeated everything. I can tell that I’m getting stronger because exercises that used to leave me sore for days (pulsing lunges with dumbbells–that’s you) seemed easier. Sun: 3 x (10 min treadmill run + 10 minutes strength). I started each treadmill run at an easy pace and upped the pace by 0.1 every minute. In case anyone is interested in the strength set, here’s what we did between runs. I really liked it! Any good runs over the weekend? My schedule this semester has me in a different city for half of the week, so the only hobby I carve out time for is running (and Trivia Crack because really, that’s like “hobby snacks”). 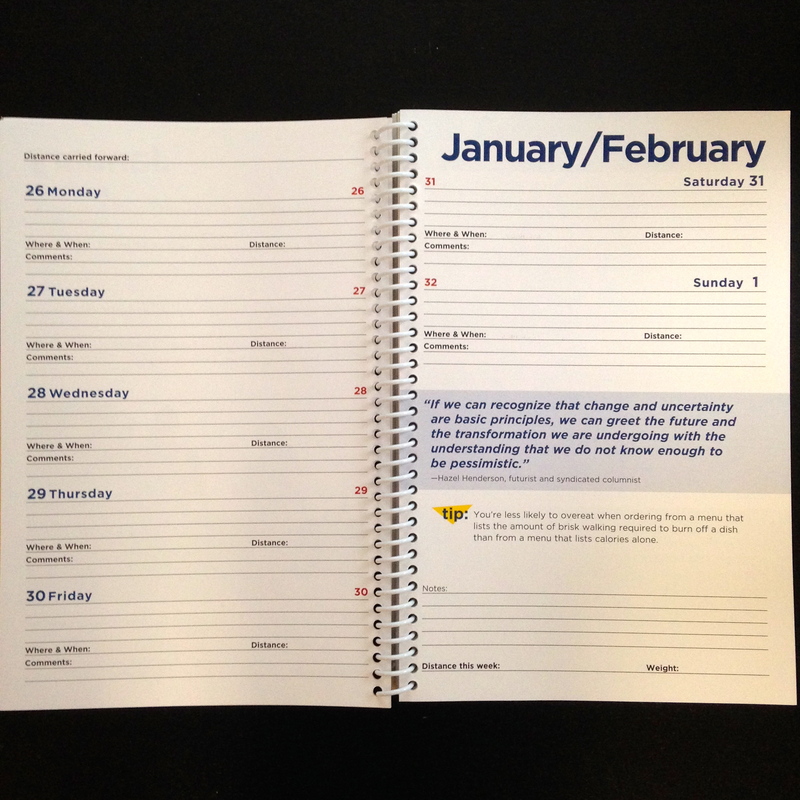 Our topics of choice today are cochlear implants or running, so let’s chat running! With one quick detour to say…HAPPY 21st BIRTHDAY to my little brother! Hi Greg. The rest of this post is straight up workouts, starting with last Saturday morning because Ryan and I had a killer workout that made me sore until Tuesday! Sun (2/8): 3 x (run 10 min + 10 min strength). 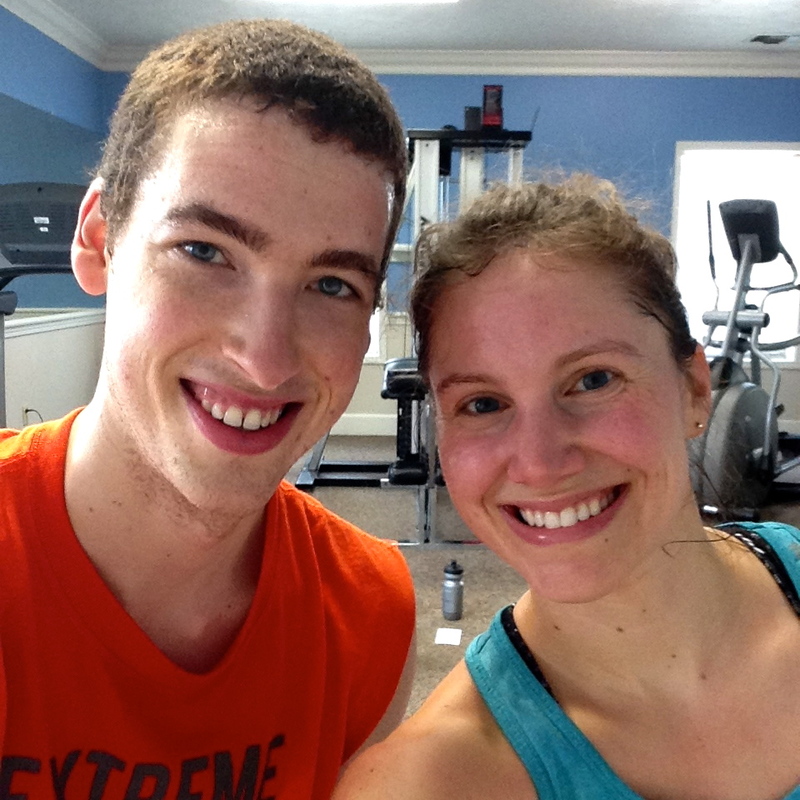 Ryan and I did the run part on the treadmill, similar to the one we did a few weeks ago. Fun! Mon (2/9): 5.5 mile run (easy pace) + 15 minute arms. The run was a good way to shake out my legs after the strength workouts over the weekend. I was on the treadmill in my apartment’s fitness room because it was really early and dark. The Fresh Prince of Bel-Air was on t.v. sooo that’s what I ended up watching. Tues (2/10): 6 miles (2 miles @ 7:30 pace). Evening treadmill run. I played the tempo miles by ear; I was honestly surprised that I was able to keep a 7:30 pace for two miles with the little amount of fast running I’ve been doing, so I was happy about that. Wed (2/11): 5.5 miles (easy pace). Evening run, on a treadmill in Indy after work. I played around with the incline (0.5-3%) but kept the run pretty easy. Fri (2/13): TBD. Possibly a long rung but it depends how I feel. I think being around little ones with runny noses in clinic has finally caught up with me, and I’m feeling a little runny myself! Do you know anyone else who has a birthday today? I know about five other people…must have been a popular day to be born! I’m at the library working on a research project and waiting to meet my friend Erin for a lunch date. We try to get coffee and catch up every two weeks, but Erin sweetly offered to do a birthday lunch this week instead of coffee, so we’re meeting at Potbelly. Potbelly and Qdoba are my two favorite sit-down-but-still-kind-of-like-fast-food places, and I’m excited for the mediterranean sandwich that I haven’t had in too long. It’s actually the only thing I’ve ever ordered from Potbelly, but it’s so good that I don’t need anything different. 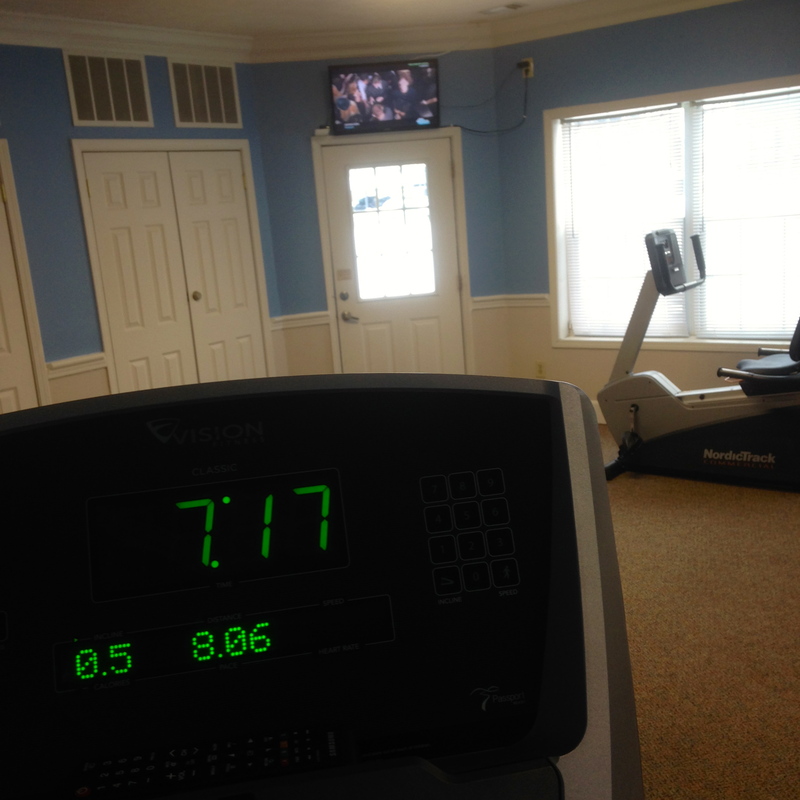 This morning, I hit the treadmill for 8 miles…my longest run post-injury! I took it at a nice, easy pace, and my knee felt 100% fine. For entertainment, I tried to convince myself that “treadmills are fun and awesome!” and when that didn’t work, I turned to an episode of Serial and VH1 Top 20 Coundown (umm again). 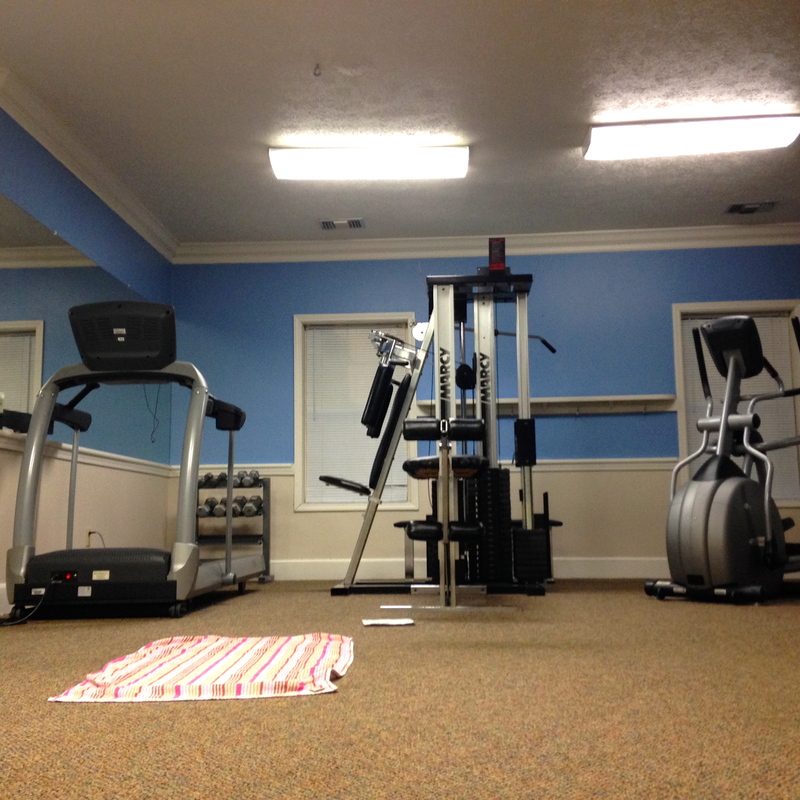 I recently discovered that I love working out in my apartment complex’s fitness center because no one is ever there. That means I can listen watch VH1’s Top 20 Countdown and not feel like a weirdo, and I can aim the fan DIRECTLY toward me. Then I spread peanut butter across the top and sometimes add crushed Honey Bunches of Oats (seriously, try it) and/or blueberries. 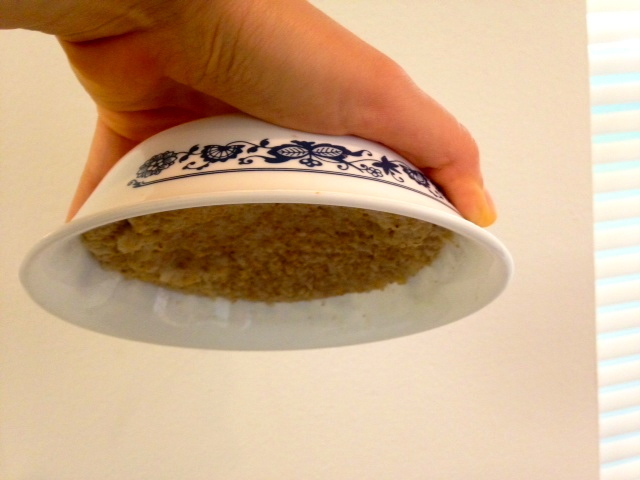 The oat base is so solid that you could probably eat it with a fork. Ryan, on the other hand, prefers his oatmeal more watery and adds in anything and everything. 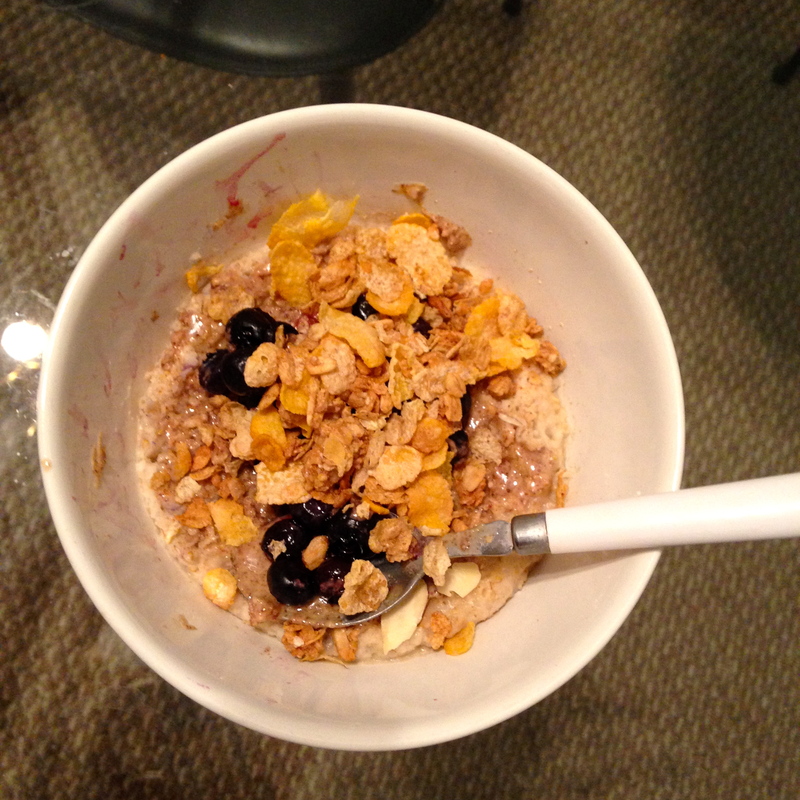 Yesterday it was almond butter, banana, Honey Bunches of Oats, blueberries, and ….wait for it….tortilla chips. Tortilla chips were a new one, but he liked the saltiness of the addition. Saturday: TBD but probably a strength & cardio circuit with Ryan. Sunday: TBD but probably the same as Saturday, but different circuit. 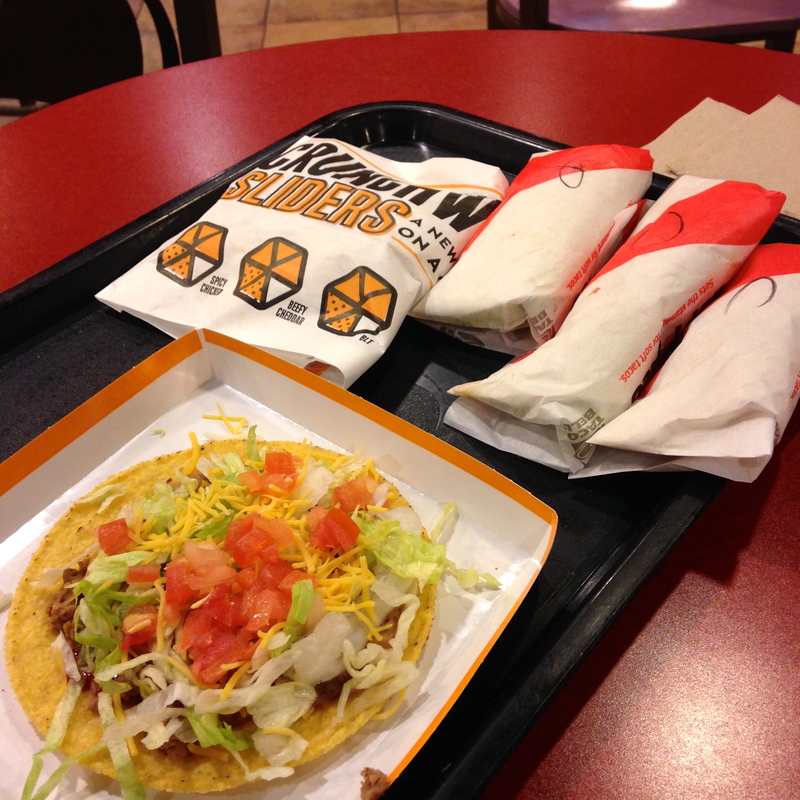 What’s your favorite sit-down-but-still-kind-of-like-fast-food place? 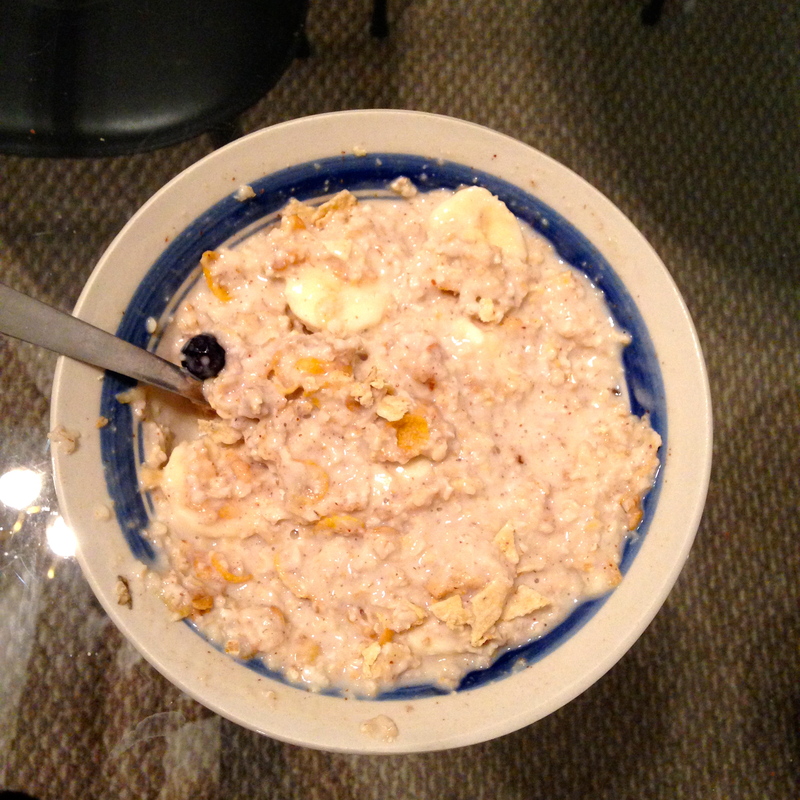 How do you eat oatmeal? Hi! Anyone else get pounded with snow on Sunday? 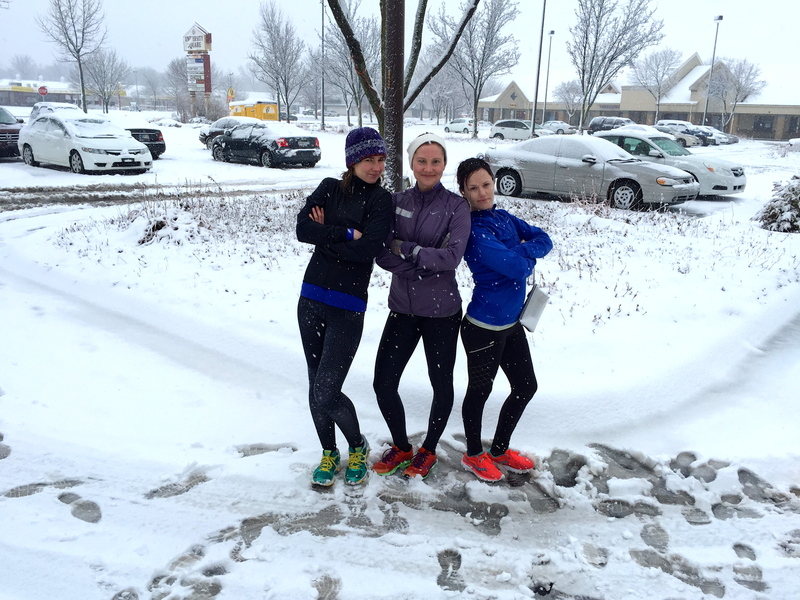 My running pals and I skipped the Groundhog 7-mile race on Sunday because it was blizzarding out, and instead, we met up late morning to run. We trudged through slushy snow and got pelted in the face with ice chunks for almost an hour. With the wind to our backs, it was gorgeous and quite enjoyable outside, but then we’d turn around and literally be attacked in the eyeballs by teeny ice pellets and want to die. I’m surprised both of my contacts stayed in my eyes. 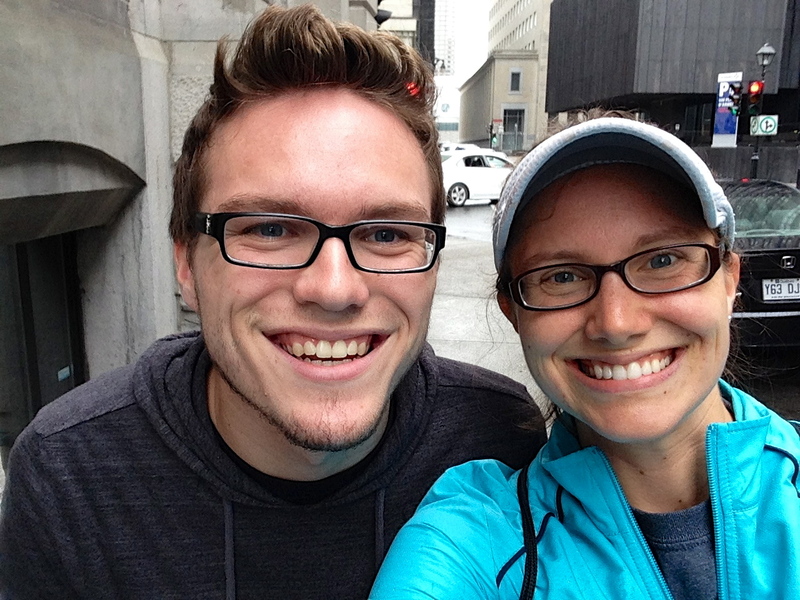 Our original plan of 7 miles turned into 6…then 5…then 4. At a 10:30 average pace. 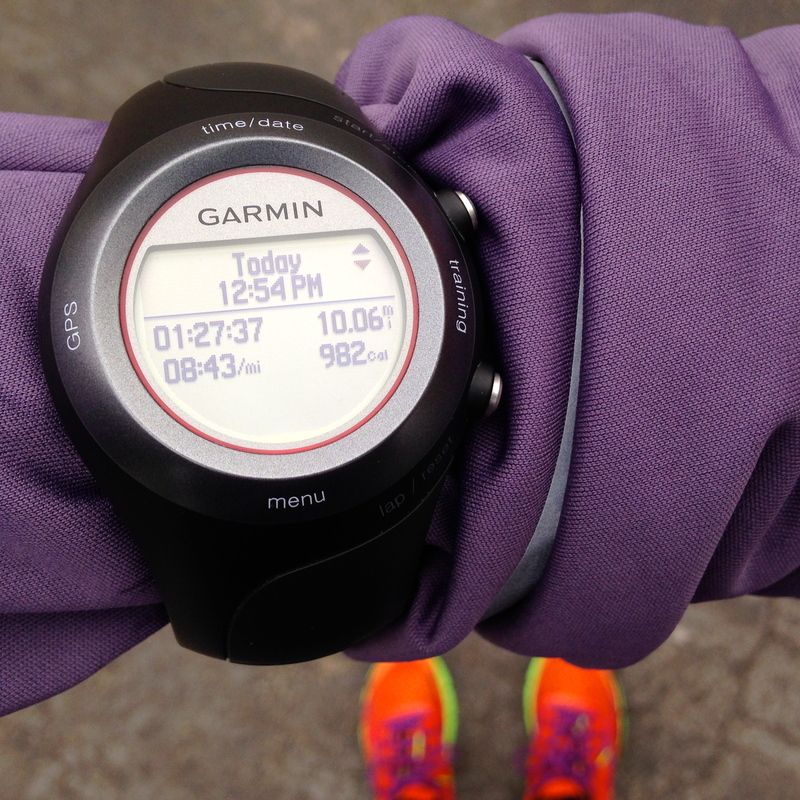 But that’s all part of winter running, and I’m glad we got a few miles in! And what a great start to my birthday. I turned 25 on Sunday! 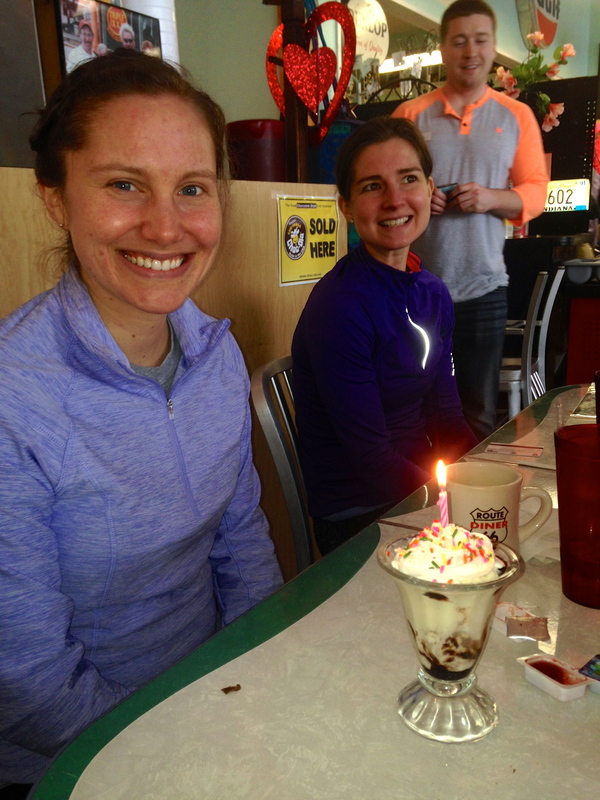 After our adventure through winter wonderland, our group went to a local diner for brunch, where I had a little birthday celebration. It is never too cold for ice cream, and you’re never too old to blow out candles! And then it kept on snowing and snowing, so I was snowed in the rest of the day by myself. Ha- it was an interesting birthday. I bailed on a Super Bowl party I was going to go to because the roads were bad, so I put on the game and talked to my sister Laura on the phone; it was almost like a party. 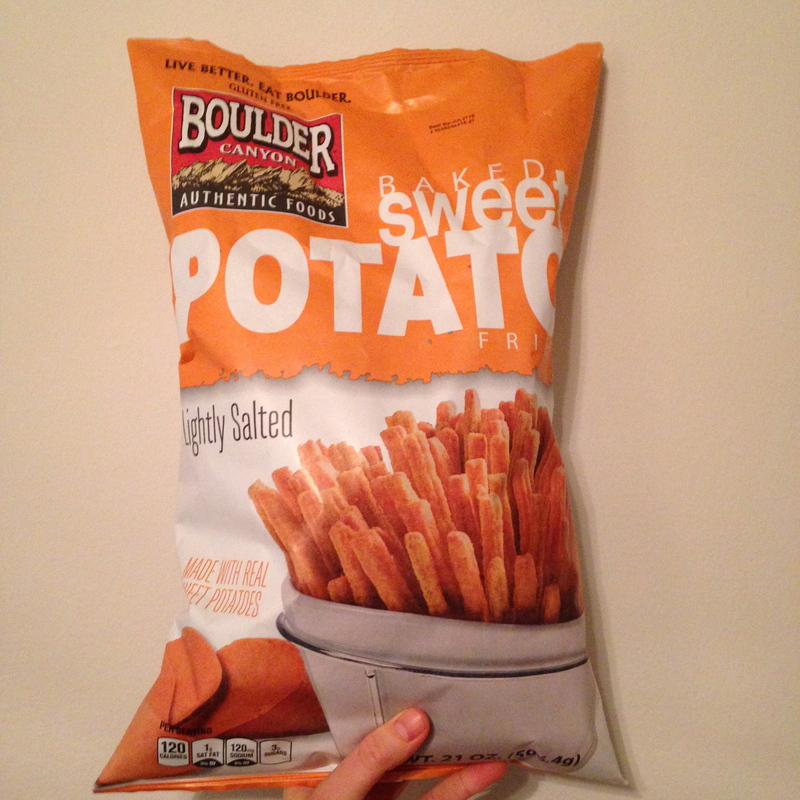 Plus, I didn’t have to share this giant 21-serving bag of Sweet Potato Fries! If you haven’t tried these bad boys, they’re from Sam’s, and they’re delicious. Fortunately for everyone, the roads cleared up enough for our seven hours of class to happen on Monday, so that was cool. I got up extra early on Monday (today) to fit in a 5:30am workout in my apartment’s fitness room, and it reminded me how much I like early morning workouts. My schedule is all over the place this semester and most of my workouts have been happening later in the day; I much prefer the early morning sweat sessions. Today was 60 minutes of strength training (similar to the “5 min on + 1 min off” workout Ryan and I did last weekend) and again, to the tune of VH1 Top 20 Music Video countdowns (I swear, it’s always on). 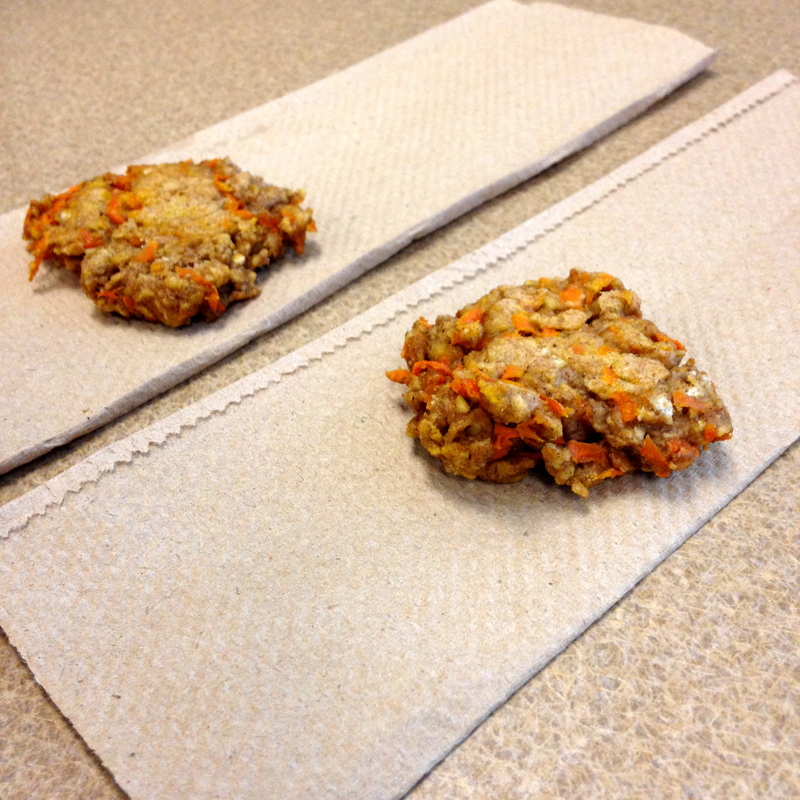 Andrea was super nice and brought these healthy carrot cake cookies to class to celebrate my birthday and Lauren’s birthday, which was a few days before mine. They had a little bit of a biscuit feel to them, but I really liked them. And perfect little poppers for so many hours of lecture. What did you do for the Super Bowl? Current favorite chip? Hello, and happy Saturday! I am enjoying a super low-key day. 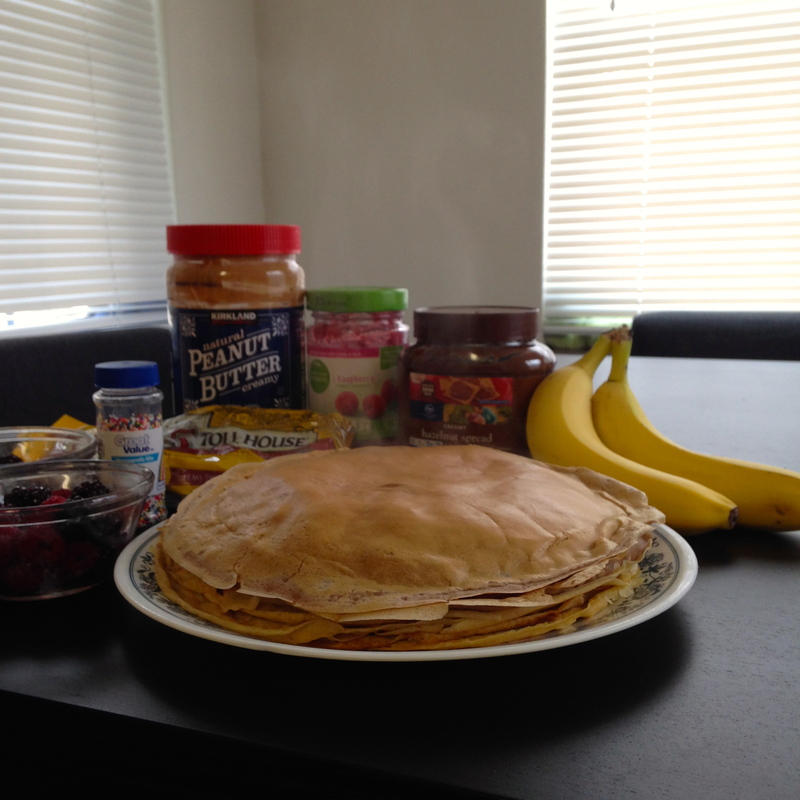 I just got back from an easy 5-miler outside, and now I’m eating pancakes and deciding which direction to take my day. Probably clothes shopping at the mall (still waiting for yoga pants to be the new dress pants) and one last hurrah through Sam’s Club. My Sam’s Club membership expires tomorrow (on my birthday…doesn’t everyone want that as a gift? ), and I don’t think I’ll renew it, so I have to make sure I’m all stocked up on my economy-sized food items. 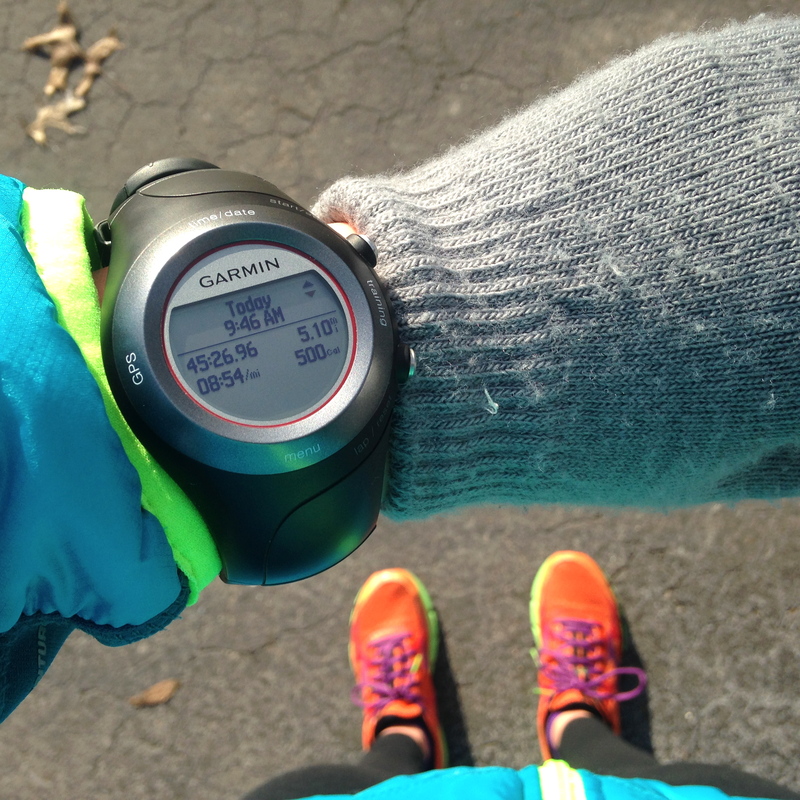 But I want to chat about running today: this week in running, an injury update, and goals! My longest run since the injury has been 6 miles, which I’ve done three times in the past two weeks, and I’m HOPING to run a 7 mile “Groundhog race” tomorrow (Sunday) near Indianapolis with a few friends. We’re under a winter storm warning tonight through tomorrow though, so I have a feeling the race might get cancelled or the roads might be too messy for the hour drive. Plus, my recovering glutes/hips/knee/ailment isn’t ready for slippery terrain yet. Monday: Rest. Busy school day, and I was SO SORE from the weight workouts Ryan and I did over the weekend. Tuesday: 5 treadmill miles, easy pace (8:39). I listened to the first episode of Serial, and time has never passed so quickly on the treadmill! (Thanks for the recommendation, Kelly!). I was only able to listen for about 30 minutes until my earbuds fell out because my ears were too sweaty, but that got me through the majority of the run. Wednesday: 6 treadmill miles with 2 miles at “tempo lite” pace. I want to ease my way back into speedwork, so I warmed up at an 8:30 pace and then varied the pace between a 7:45-8:00 for miles 4 & 5. Felt good! Friday: 60 minute circuit: 4 x (run 1/2 mile + 15 weighted squats, 15 push ups, 10 step ups, 10 burpees, 10 single leg bridges, 1:00 plank, 10 side plank dips, 20 leg lifts). Saturday: 5 miles outside, easy pace (8:54). This felt really hard, but I was happy to run outside. I don’t feel like I’m completely healed yet, but I’m definitely moving forward. To back up a bit for anyone new, I’ve been dealing with right-side knee pain since a marathon last May, which slowly got worse and worse until it hurt to walk at the beginning of November. I transitioned my workouts to the AMT (until that started to hurt my knee) and then to the ARC trainer (until that started to hurt my knee), and then finally settled on cycling and strength training with 1-4 rest days per week. I’ve been working with a PT, but I only see him about once a month because he is in my hometown, a few hours away. From what I understand about WHAT this injury is/was, it’s ITBS (IT-band syndrome) on the right side that is/was caused by my hips, sacrum, & lumbar spine rotating to the right. This threw me for a loop because I think ITBS knee pain is usually the result of weak hip abductors on the same side, but my hips & glutes were weaker on the opposite side (left side). My pelvis rotated to the stronger side (the right side), which caused a whole host of issues, including a leg length discrepancy, a weird foot strike to subconsciously compensate for the leg length issue, SI-joint dysfunction, and ITBS. At least that was my interpretation of the million questions I asked my PT, so that may not be 100% accurate. Anyway, he had me doing glute & hip strengthening exercises on my weaker side only (left side) for a few weeks, and now I’ve graduated to doing both sides. I’m not the perfect patient, but I really like to run, so I’ve been trying hard to keep up with those PT exercises. The entire routine is 8 moves and takes about an hour (who has time for that? ), so I usually pick 3 moves and do two sets of 15 reps.
Squats with resistance band around knees. Example. Quadrupled Hip External Rotation. Example. Single leg deadlift (no weights). Example. Aside from trying to do 15-20 minutes of hip & glute strength a day, I’m focusing on my running form—“tucking my tail” to help activate my glutes when I run. As far as I can tell, it’s helping! First and foremost, to stay injury-free. Distance-wise, I’d like to be able to run 13 miles by the end of March, which should be fine. I have a marathon relay the last weekend in March, and my leg is a half marathon. There are a few other potential races I could do this spring, but we’ll see. Pace-wise, I’m playing that by ear and not setting any goals yet. So that’s where I am with running! Enjoy the weekend! Where do you put your key when you run? (I had a moment of panic this morning when I forgot that I tied it to my shoe and couldn’t find it in my pocket). Hello! Hope you’re having a nice weekend. 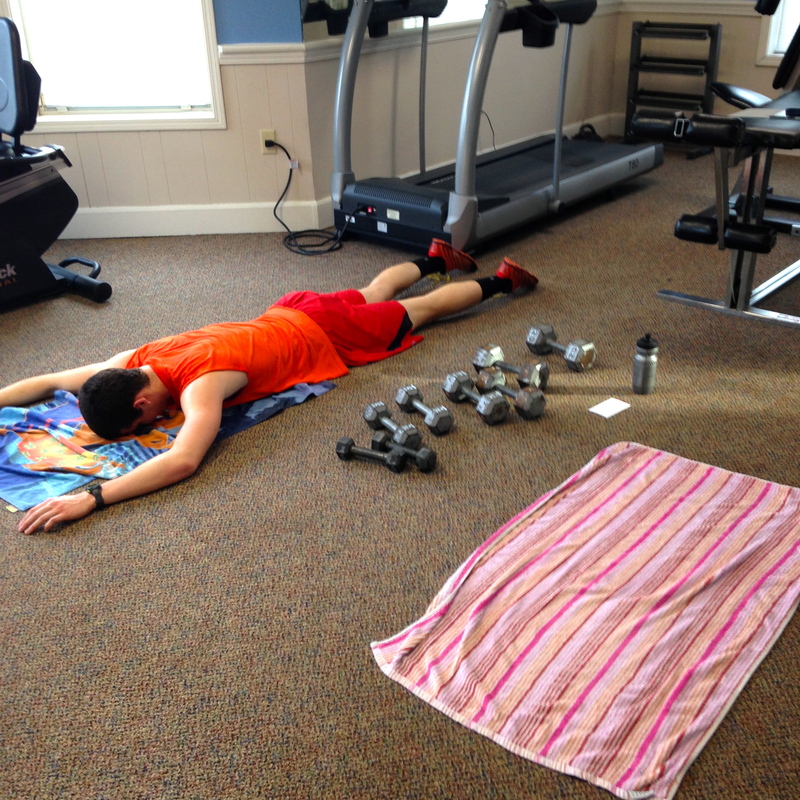 Ryan and I just finished a killer workout, and then he left early for his long drive home because it’s sleeting. I guess I can’t complain too much since it’s been relatively warm, but ugh winter. Workout One: 12 x (5 min AMRAP of circuit + 1 min rest). We created 5 different circuits that each had four moves (e.g. 12 push ups + 10 lunge pulses + 8 reverse lunges + 6 burpees) and went through each circuit AMRAP (as many rounds as possible) for 5 minutes, rested for 1 minute, and then did it again. It took a little over an hour to do all 5 different circuits twice, plus an extra “choose your favorite” two circuits at the end. We used the Interval Timer app on my iPad to keep track of the 5:1 minute set-up, which worked out really well. This workout was like sneaky hard…it didn’t feel like death during the workout, but it did after. Workout Two: 3 x (10 min treadmill run + 10 min strength). One person was on the treadmill while the other person did the strength circuit, and we switched every 10 minutes. On the treadmill, we tried to keep the incline high. I set the incline at a 4-5% grade on my first round, and when I got back on the treadmill, I saw that Ryan had it at 10%?! I cranked that sucker right back down. The strength set was AMRAP of a list we made (included burpees, weighted squats, weighted Russian twists, mountain climbers, supermans, donkey kicks, and push ups). The only change I’d make is to do a different strength circuit each time, but otherwise, this workout was a good change of pace. Ryan and I read and studied for a long time, and that about sums up the rest of the weekend. I finished reading Karen (loved it!) last week and started Devil in the White City by Erik Larson (2015 reading challenge category= book with a color in the title). 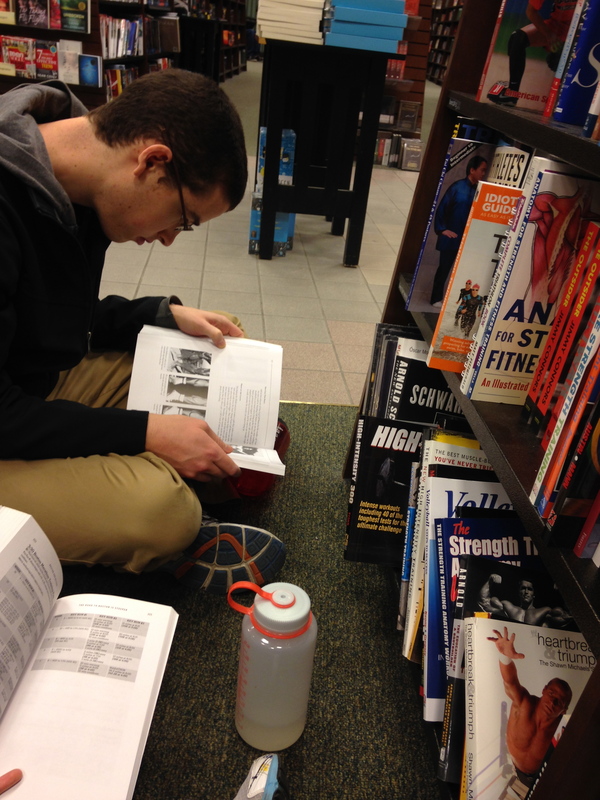 We continued our reading spree at Barnes & Noble, where we sat on the floor in the running section for a long time. Weird or not weird? 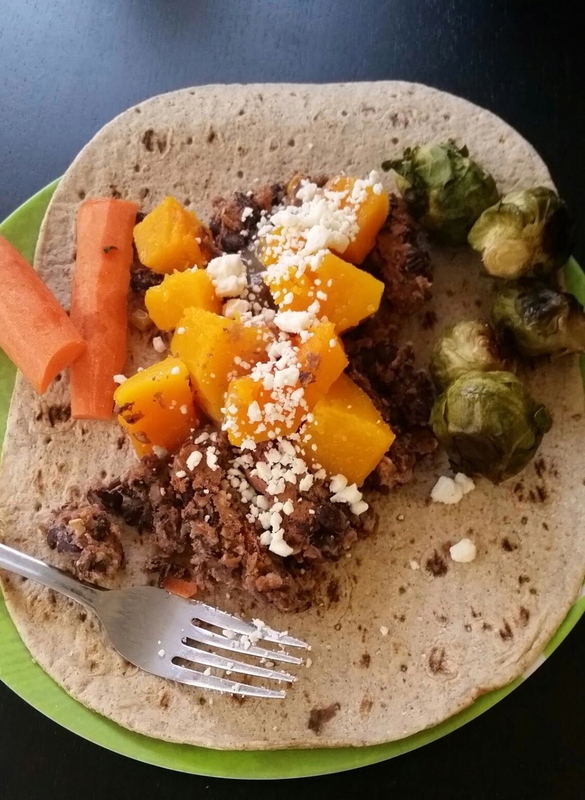 And weird or not weird that we had super healthy “experimental bean ball” wraps, squash, and brussels sprouts for lunch…and Taco Bell for dinner? Just keeping our digestive systems guessing. I also got two fun packages in the mail! The other fun package was from Shutterfly. 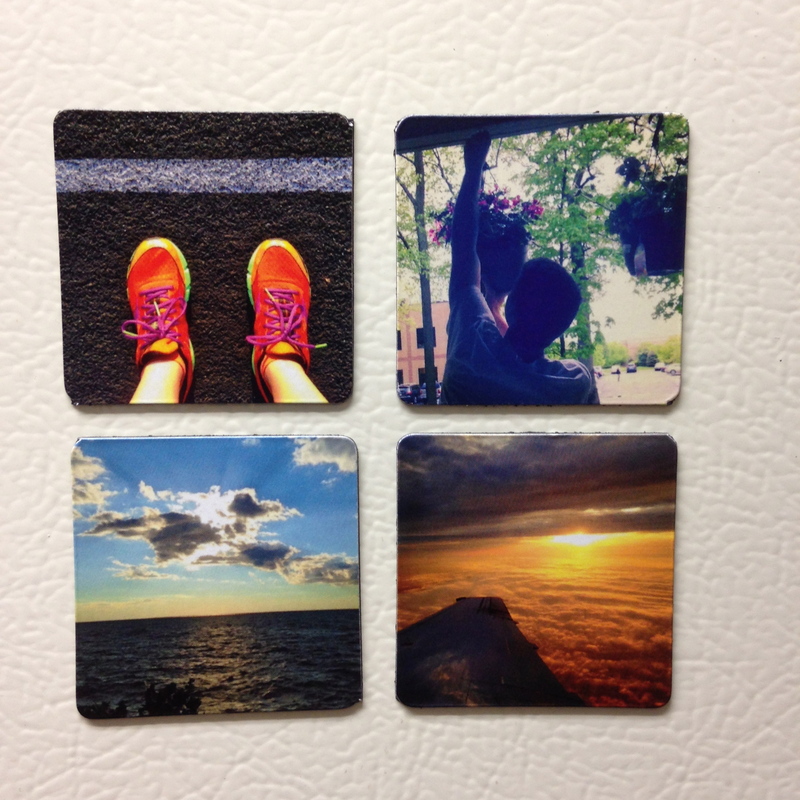 I ordered a pack of photo magnets from because there was a special deal and they were free, and I’m happy with how they turned out! I’m also proud of myself for decorating the fridge…I’ve lived in the same place for over a year, and all of my picture frames are sitting on the floor. The bottom left is Lake Erie, and the bottom right is on a flight to Montreal. Are you into decorating or a mega decorating procrastinator? 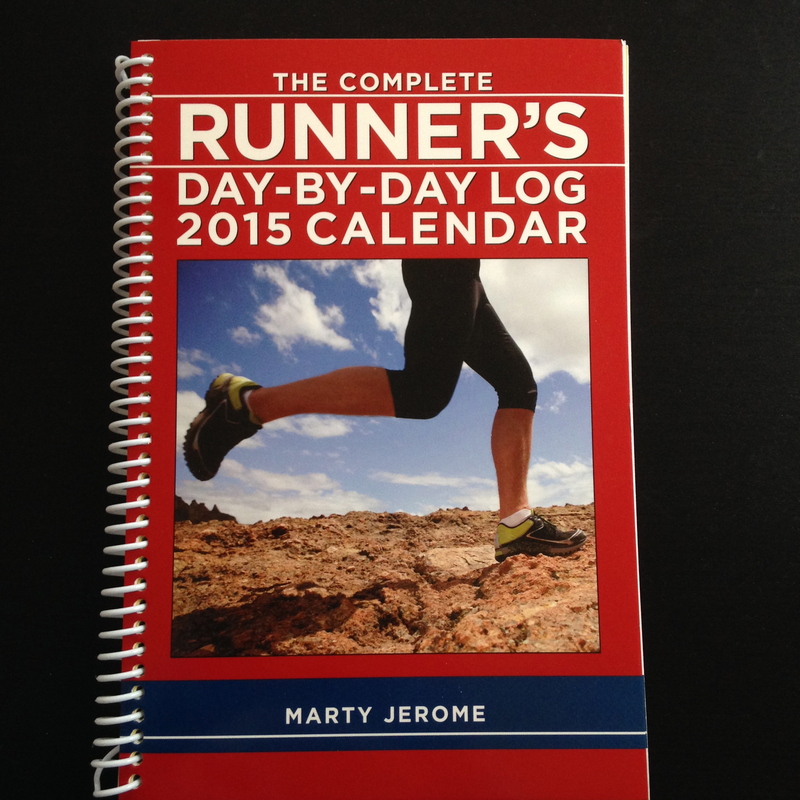 Do you use a running log?